RICHLAND, Wash. – Justin Michaud enjoys drinking Italian wines so he considered a Super Tuscan approach with Sangiovese as the winemaker at Coyote Canyon Winery during the historically hot 2015 vintage. 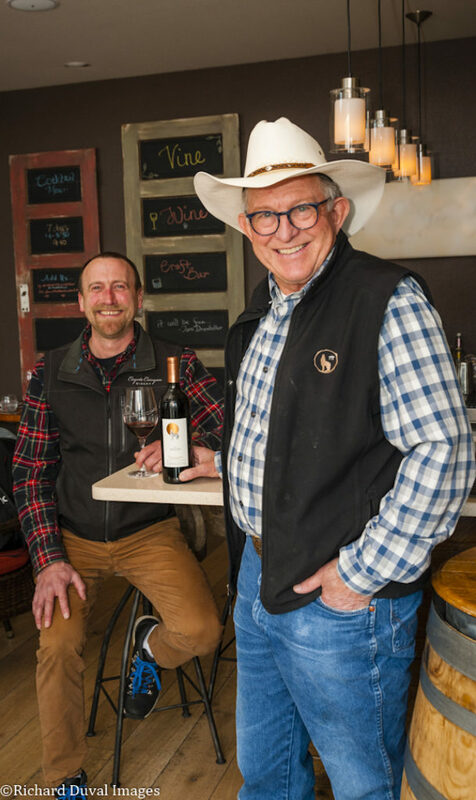 Fortunately, his boss, Mike Andrews, owner of the Prosser, Wash., winery, also farms some acclaimed Cabernet Sauvignon throughout his 1,350-acre Coyote Canyon Vineyard. “If you’ve got it, who wouldn’t want to throw in a little Horse Heaven Hills Cab in with Sangiovese?” Michaud said. 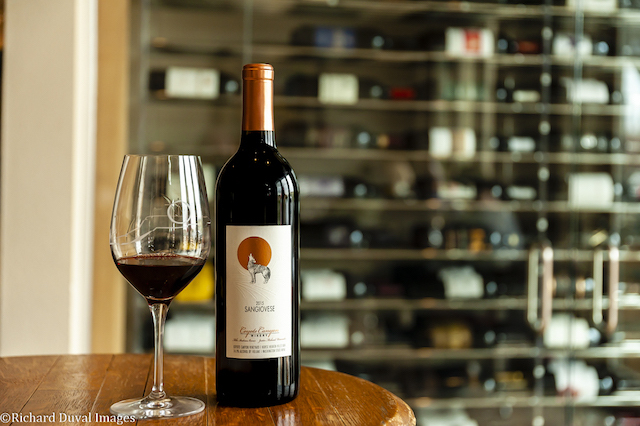 It turned out to be a winning formula as the Coyote Canyon 2015 Sangiovese emerged from a gauntlet of other gold-medal winners to win best of show at the seventh annual Cascadia International Wine Competition. 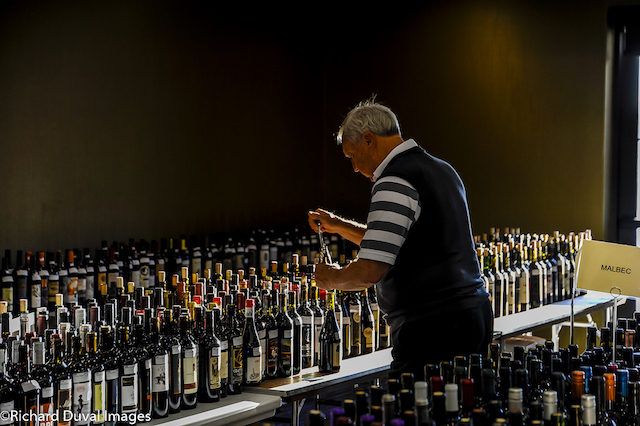 At 1,040 entries, the Cascadia is the largest international wine judging staged in the Pacific Northwest. A panel of 22 winemakers, viticulturists, wine buyers, writers and restaurateurs from California, Washington, Oregon, Idaho and British Columbia met April 9-11 a stone’s throw from the Columbia River at the Courtyard Marriott Columbia Point in Richland, Wash. 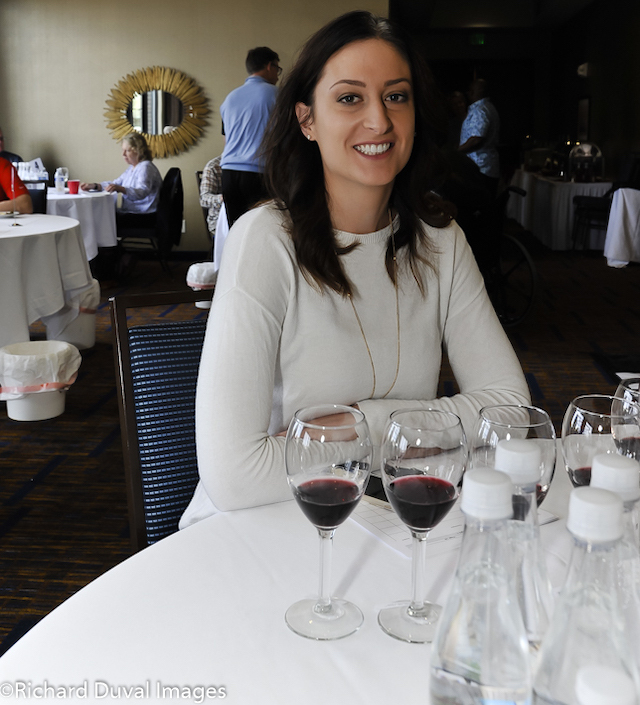 Among the judges was Erin Kirschenmann, managing editor of Wine Business Monthly magazine in Sonoma, Calif. Emerging as the top white wine of the Cascadia was the Jones of Washington 2017 Reserve Chardonnay, crafted by Victor Palencia. It’s the latest honor for Palencia, whose work prompted Wine Press Northwest magazine to name his eponymous brand as the 2019 Pacific Northwest Winery of the Year. Scott Williams and his family, perhaps best known for suave age-worthy reds from Red Mountain, showed their skillful versatility by winning best dessert wine with their Kiona Vineyards and Winery 2018 Estate Chenin Blanc Ice Wine. 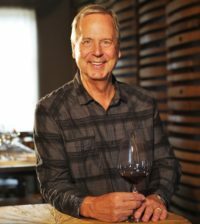 Williams, a second-generation winemaker and vineyard manager, recently was chosen to serve as Honorary Grower for this year’s Auction of Washington Wines. The Kings of Pinot Noir in Oregon reigned over the rosé field at the Cascadia as King Estate winemaker Brent Stone, a product of Washington State University, pulled Pinot Noir from the King family’s Demeter-USA certified Biodynamic estate vineyard near Eugene and other organically farmed sites in the Willamette Valley for a beautiful early snapshot of the 2018 vintage. Westport Winery Garden Resort in Washington’s Grays Harbor County earned top honors for best nongrape wine with their Little Wild, a delicious blend of Marionberry with Riesling from historic Red Willow Vineyard in the Yakima Valley. With the NorthWest Wine Summit on hiatus as a result of the 2018 death of founder Parks Redwine, no competition in the Northwest recruits as many winemakers to serve as judges as the Cascadia. And this year’s panel featured 10 of the region’s top producers. They were spread out across the seven panels to serve as another level of quality control. However, many of the wines showed the benefits of this continued string of warm vintages. Of the 1,040 entries, nearly 16 percent merited a gold medal or better. Silver medals accounted for 37 percent of the awards, while only 15 percent failed to earn recognition. This year’s panelists were Naomi Boutz, owner, Vine & Olive Riverstone Eatery and Wine Bar, Coeur d’Alene, Idaho; Daniel Carr, co-owner, Visconti’s Hospitality Group, Wenatchee, Wash.; Ilene Dudunake, owner, A New Vintage Wine Shop, Meridian, Idaho; Kat Dykes, wine concierge, The Lodge at Columbia Point, Richland. ; Ariel Eberle, head winemaker, Yamhill Valley Vineyards, McMinnville, Ore.; Glenn Grabiec, certified sommelier, Bartholomew Winery, Kennewick, Wash.; Sean Hails, senior manager of operations/winemaking, Columbia Winery, Woodinville, Wash.; Lane Hoss, wine buyer/vice president of operations for Anthony’s Restaurants, Kirkland, Wash.; Megan Hughes, enologist/white winemaker, Barnard Griffin Winery, Richland; Gregg McConnell, editor, Wine Press Northwest, Kennewick, Wash.; Katy Michaud, head winemaker, Double Canyon, West Richland, Wash.; Jessica Munnell, co-owner/winemaker, Wautoma Wines, West Richland, Wash.; Tim Norris, manager, Reds Wine Bar, Kent, Wash.; Andy Perdue, wine writer, The Seattle Times; Leslie Preston, owner/winemaker, Coiled Wines, Garden City, Idaho; Lenny Rede, wine & spirits buyer, New Seasons Market, Mercer Island, Wash.; Stephen Reustle, co-owner/winemaker, Reustle-Prayer Rock Vineyards, Roseburg, Ore.; Frank Roth, winemaker, Tagaris Winery, Richland, Wash.; Howard Soon, winemaker, Vanessa Vineyard, Cawston, British Columbia; Coco Umiker, co-owner/winemaker, Clearwater Canyon Cellars, Lewiston, Idaho; and Kent Waliser, director of vineyard operations, Sagemoor Farms, Pasco, Wash.
“It was the great spirit of respect and cooperation that made it seem more like fun than work,” Soon said. The late Tom Drumheller grew up in Walla Walla, and the renowned Northwest hotelier managed to see his wine-themed The Lodge at Columbia Point come to life just before dying from cancer. On Sunday, May 19, the Taste of Cascadia returns to The Lodge, where some of the top wines from the Cascadia International Wine Competition will be poured. Cost to attend The Taste of Cascadia is $89, which includes small plates by chef Pauline Garza. And $10 of each ticket will go toward the Tom Drumheller Memorial Scholarship at Washington State University’s Hospitality Department. In the spring of 2017, a few months before he was diagnosed with cancer, Drumheller was inducted into the school’s Carson College Business Hall of Fame. 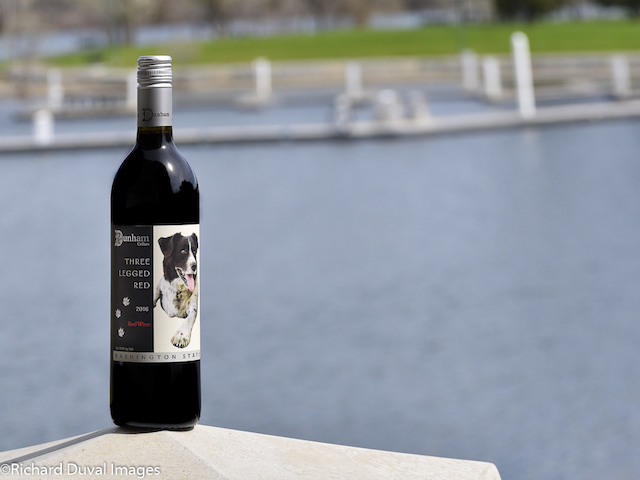 This year, the Dunham Cellars 2016 Three Legged Red received the Tom Drumheller Memorial Award as the top wine produced by a Walla Walla, Wash., winery. Columbia Gorge destination Maryhill Winery opens two more tasting rooms in 2019, and New Zealand-born talent Richard Batchelor will fill them with some of the Pacific Northwest’s best wines. 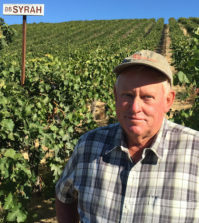 He and right-hand man Dirk Richardson delivered 10 gold medals for owners Craig and Vicki Leuthold, among those was a double gold for Cab from McKinley Springs, a sibling planting to Coyote Canyon Vineyard. Mercer Estates continues to impress during the winemaking transition from Jessica Munnell to Jeremy Santo, and their combined efforts led to five gold medals, including a pair of best-of-class awards for blended wines. Milbrandt Vineyards, Wine Press Northwest’s reigning Washington Winery of the Year, showed its versatility by winning four gold medals across red Bordeaux varieties, a $13 rosé of Syrah and a $13 Riesling. And to no surprise, the Horse Heaven Hills also gave birth to the top Cabernet Sauvignon of the competition. Richland restaurateur J.D. Nolan works with the Mercer team for the 2016 Horse Heaven Hills Cab under his Schooler Nolan Winery label, which is available at his Fat Olives Restaurant. 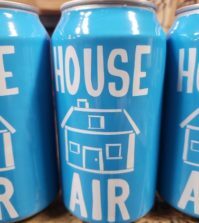 For the first time, canned wines officially were as part of the Cascadia. They were judged alongside traditional bottled wines, and three of them went on to win gold medals. They included Barnard Griffin’s heavily decorated Rosé of Sangiovese, Mercer Estate’s rosé inside its slender and groundbreaking ICAN project and the Recline Ridge Wine2Go White from British Columbia. Earlier this year, Cellardoor Winery in Maine made headlines across the country with its 10 gold medals at the San Francisco Chronicle Wine Competition. 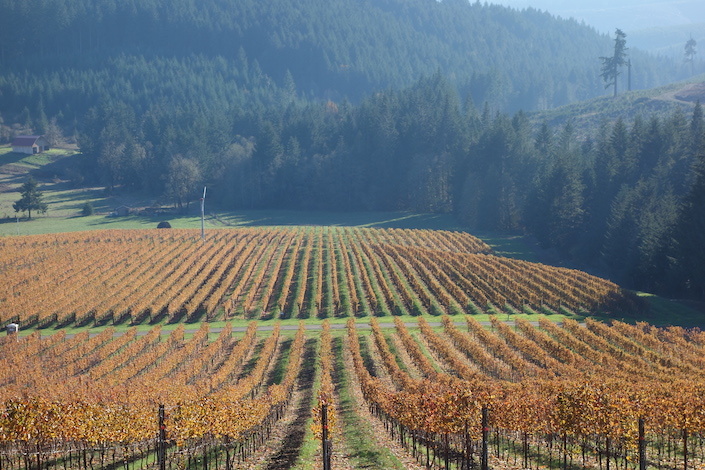 Many of the wines crafted on the East Coast by Aaron Peet qualify for the Cascadia because they are made with fruit from either Washington or Oregon. Peet’s formal winemaking education came at Walla Walla Community College, and his College Cellars instructors deserved to be proud with the eight golds at the Cascadia for Cellardoor, including BOC awards for Cabernet Franc and Tempranillo and a double gold for a Cab-based blend. Current releases of wines produced by students and instructors at College Cellars spun out four gold medals, two of them double gold. And Yakima Valley Vintners, the winemaking and viticulture program at Yakima Valley College, can boast of the best Albariño of the competition. They used grapes from the fascinating Naches Heights AVA west of Yakima. 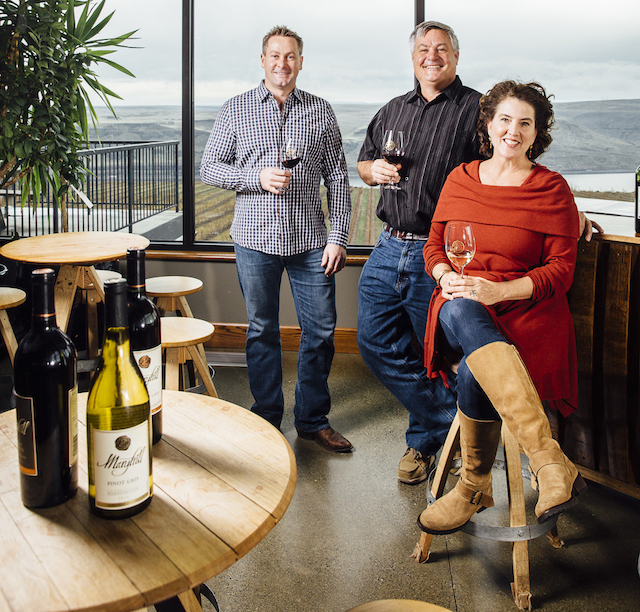 Alumni of College Cellars who helped bring Cascadia glory back to their winery include Palencia, Amy Alvarez-Wampfler (Abeja), Shane Collins (Rocky Pond), Marcus Miller (Airfield Estates) and Ryan Raber (Tertulia Cellars). As is custom, Canadian entries from British Columbia wowed judges at the Cascadia, combining for 32 gold medals or better. Eight of those won either best of class or a double gold medal. While two-time defending champion Wild Goose Vineyards came up short of winning best of show at the Cascadia, the Kruger family came through with two stunning works involving Gewürztraminer, including their popular Autumn Gold, a deliciously fun white commonly known as “Mom’s Wine” – an annual tribute to their late matriarch, Susanna. Soon, one of Canada’s most well-liked and respected winemakers, returned home after the judging with three gold-medal efforts for Vanessa Vineyard in the emerging region that is the Similkameen Valley. His lineup was led by the 2014 Syrah, which earned best of class, a 2015 Cabernet Franc that took best of class at last year’s Great Northwest Invitational and the complex 2018 Viognier. There were 14 wines from Idaho winemakers that were awarded gold or better, and the majority of those were won by women winemakers. Melanie Krause, a product of Ste. 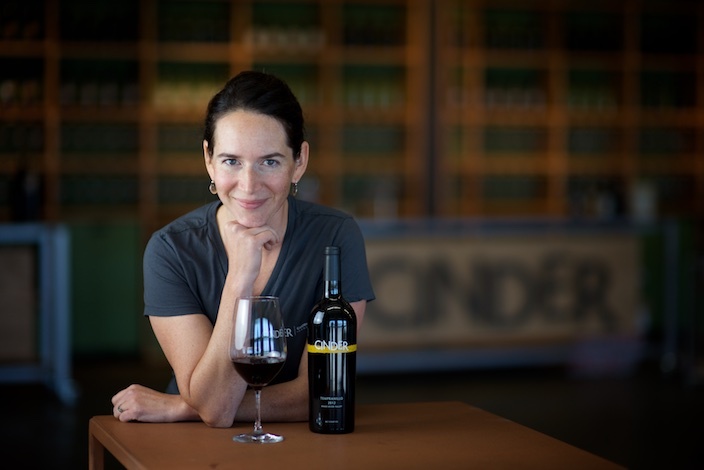 Michelle Wine Estates, won four gold medals with distinctly different styles of wine, ranging from her Dry Viognier, Off-Dry Riesling and Rosé of Cinsault to her Sangio-led blend under her consumer-priced Laissez Faire brand. Clearwater Canyon Cellars in Lewiston produced a trio of top awards for red wine, led by the best Carménère of the competition from Coco Umiker. 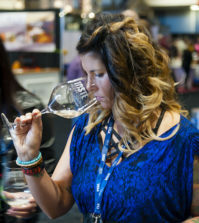 No woman winemaker has been award more Platinums through Wine Press Northwest’s annual year-end judging of gold medals, so the “Queen of Platinum” continues to build her list of qualifiers for the October 2019 competition. At the Cascadia, she won a BOC for her new Wine Project blend as well as her flagship Renaissance Red, a tribute to the revival of the historic Lewis-Clark Valley wine industry. The Williamson family, longtime farmers on the Sunnyslope in the Snake River Valley, came away from Seattle’s international Riesling Rendezvous conference in 2016 more inspired than ever to dial down the sweetness of their own Riesling program. Their efforts with talented winemaker Greg Koenig showed at the Cascadia as the Williamson Vineyards 2017 Estate Dry Riesling topped the field. It’s residual sugar came in at a mere 3 grams per liter – just 0.3 percent. And upstart Two Bad Labs Vineyard, another LC Valley producer, turned heads with its 2017 Cabernet Franc, which received a unanimous double gold medal. Iris Vineyard near Eugene has been quite a run recently and it produced the best Oregon Pinot Noir of the Cascadia, earning it the honor as the Cole Danehower Memorial Award. Its other reasonably priced gold-medal winner – the 2015 Chalice Estate Chardonnay – was among the four wines that won gold last fall at the New Orleans International Wine Awards. Aaron Lieberman is the winemaker for Iris Vineyards owner Richard Boyles and Pamela Frey, who founded Chalice Vineyard at Iris Hill in 1996. They have planted 57 acres of vines across their 870-acre estate in the Lorane Valley. A year ago, Spangler Vineyards was named Oregon Winery of the Year by Wine Press Northwest. 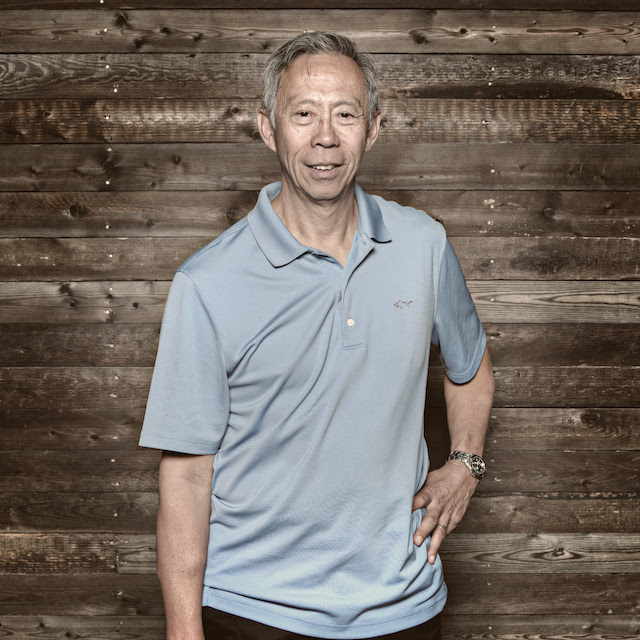 This spring, he showcased his consistency at the Cascadia with gold medals for Petit Verdot, Carménère and estate Dolcetto. 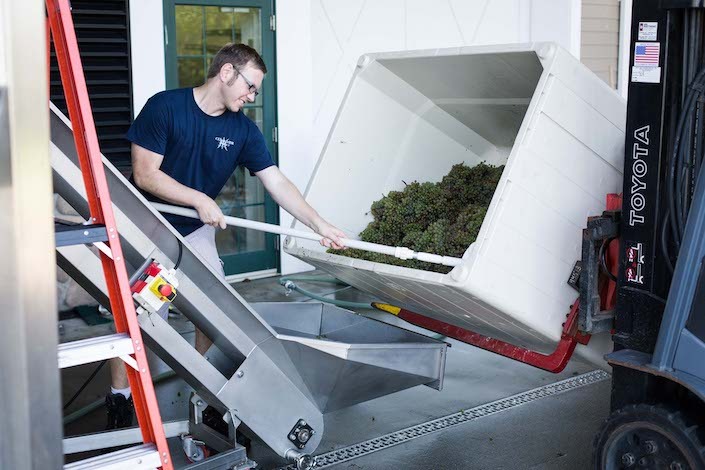 Justin Michaud, 41, has been making wine in Washington state since 2002 when he and his winemaking wife, Katy Michaud, arrived from Santa Cruz, Calif. They landed in the Walla Walla Valley, where he worked at Pepper Bridge, Canoe Ridge Vineyard, Bergevin Lane and Ash Hollow. Along the way, the couple spent a harvest in New Zealand at Kim Crawford. Prior to arriving at Coyote Canyon in 2012, he spent four years at Goose Ridge in Richland. Last year, Katy took over as head winemaker at Double Canyon, which pulls heavily from the Horse Heaven Hills. Interestingly, until his arrival at Coyote Canyon, Justin never had worked with Horse Heaven Hills fruit. Now, he works exclusively with grapes from the vast American Viticultural Area that’s home to many of the state’s largest vineyards, including that of Andrews. Among those are Italian icons Barbera and Primitivo, which Michaud prefers to use Merlot as the blender for each. He finished the stellar 2015 Sangiovese with 12 percent contribution from Cab. Two years ago, he’d won best of class at the Savor NW Wine Awards for a 2013 Sangiovese that he co-fermented with a bit of Barbera. He went a different direction during the historically hot 2015 vintage, which marked final hand-picked fruit at Coyote Canyon Vineyard. He also uses a light touch of barrel on his Sangiovese, a blend of once-used American oak and some French to help showcase the variety. Andrews is no stranger to success when it comes to wine competitions, which include having won some top awards at the Houston Livestock Show & Rodeo International Wine Competition, which is one of the largest in the country. It’s been a nice first half of April for Michaud, who grew up in Virginia and had the best bracket in his NCAA men’s basketball pool, thanks to the University of Virginia winning the tournament. And for the record, Katy, voted for the King Estate 2018 Rosé of Pinot Noir as best of show. Her husband’s 2018 Rosé from Barbera earned a silver, so it didn’t join the Coyote Canyon 2015 Sangiovese in the sweepstakes round. Cellardoor Winery 2016 Tempranillo, American $22.